This series of 41 entries on E-poetry in social media has focused on works that engage digital and social media’s affordances and constraints to produce works that push the boundaries of what is possible in print. For that reason, this blog isn’t particularly interested in traditional poetry published via online networks, as good as it might be, with one exception: Alan Sondheim. A prolific writer, musician, and artist, he takes on the “social” in social media to heart, building a writing and publication practice that is truly native to this emerging publication and artistic environment. 1 —————‘s suggestion that I join Future Culture. 2 The psychiatric confessions on Future Culture coupled with someone’s suicide hoax – ———————-’s response – the complaint to the sys- admin. interruption of the POMO-L list. 4 —————-’s archiving of my work. 5 Problems with the Arts list and —————— – writing off-list, becoming unsubbed – ———-’ complaining, the list shutting down. 6 Posting the “religious” text to Futurec, response based on religious mania. 7 ——————- and I deciding to start Cybermind. 8 ——————‘s objection to Deleuze posts by ——- and ————. beginning new account on World. 10 ——————-s shakiness with the current lists – temporarily closing down, imitating the Spoon Collective. 11 Formation and resolution of the Spoon Collective. 12 Flirt with ———— – until the packaging was sent. – her upset over the nightmare dream I related to her. times, contact with NISC.tw. Discussion with —————— about the validity of unsubbing. 16 ———— and I posting the no slur requirement on Cybermind and its fallout. 19 ——-’s co-moderation and its cancellation. 20 ———-’ eating disorders and related posts. 22 Hacking: My being unsubbed from Cybermind and fop, —‘s posts under other names, ——‘s resentments. Arguments on Spoon about hidden control characters, —‘s posts cancelling archived files. reposts from Usenet to lists. 24 Spoon collective debate about depth vs. lateriality on lists. 25 ———— and ————— dominating Future Culture at various times – problems with libertarian/right-wing attitudes. The gun-control debate. Incoherencies. ———————‘s posts. 26 Flamewar with Mindvox – Fringeware list siding with ———. 27 Continuous New School server problems including bounced messages. 28 Five unsubbings in a row without comment from the Derrida list. 29 The Spoon lists going to closed moderation. 30 Hacking with an Australian message on the Derrida list. 31 My work available on ————-’ WWW site. 32 Changes for me in family relations as a result of greater communication with ————- and —————..
33 Problems with Panix and the SLIP account – no support. 34 ———————-’s and others’ Internet affairs. 35 Sudden moments of personal confession via private email – of loneliness, sadness, loss. Answering condolence posts and telephone calls in relation to ———‘s death. Absence of photographs of ———-. ———- – who had fingered me, found no such user. 37 Back and forth with ————— on one 486/66, Mosaic with his picture on the other. As you can see, Sondheim has been quite the presence in online communities, and his participation in several forms of early social media has not been uncontroversial. His prolific writing and publication through these channels can exert some pressure because it is conceptually and thematically challenging work. It is also clear that Sondheim is deeply invested in seeing online community spaces remain as open channels for communication and publication. The early days of the Internet were ones in which notions of netiquette were being developed almost through trial and error, and his postings have been interpreted as a kind of spamming behavior, rather than as a creative outlet. This quote from an interview Sondheim gave to Gary Sullivan is revealing of how he perceives his writing space and cultural reception. But the Net also allows the reception of an unknown and international galactic audience, a flow of texts and partial-texts flowing through the wires, the mesmeric feeling of writing a text online, while announcements of email and other things flow through the editor—everything alive in a way that things aren’t in other text-based media. Both my video and film work, by the way, had text-overs quite often—created in all sorts of ways—so that there was often a reading that would accompany the site/sighting/citing of the images. So I wasn’t thinking about doing an “end-run” as you ask, but augmenting the absence of any run at all. And I still feel deeply delegitmized, by the way, by this—as if, since my work is online, I can’t really be taken seriously by other writers. I’m almost never asked to readings, conferences, etc. I was very lucky with Nottingham Trent University and Sue Thomas, to receive a virtual writer-in-residency with the trAce online writing program/community there (September 1999 – February 2000), but god forbid I should ever be asked to a conference on so-called avant-garde poetics. The question of how society values a poet’s work is clearly still based upon the model of book publication— in which prestige is granted by publishers who become arbiters of taste— any kind of self-publication effort renders the work unworthy of critical attention. This kind of model wouldn’t suit Sondheim at all, considering that his creative practice is of constant artistic production and publication through social networks, and other media. For example, his “Internet Text” grows every day and by the time it was collected in the Electronic Literature Collection, Volume 1 (in 2006) it was already more than could be expeditiously read by traditional methods for my I ♥ E-Poetry entry. I had to resort to distant-reading methods, namely a word-frequency analysis to get a broader view than I could’ve achieved by reading a few samples. How else can a critic be able to assess a body of work that grows faster than the speed of criticism? To close read anything but a sampling of Sondheim would require a kind of absurd 1:1 mapping alluded to in Borges’ fiction. Perhaps it requires a collective effort to read and appreciate Sondheim’s oeuvre. Is this why Sondheim has relied on a mode of publication that comes with built in group communication channel, as opposed to the highly individualized reading experience offered by the book? The title to this entry links to a Google search on Alan Sondheim, in part because to attempt to reduce him to a link, even if it’s to his website, is insufficient. He is everywhere. Writing. Go find him. Hi Leonardo – I think what’s overlooked in the review is that, at least for me, the work up at the site isn’t poetrty; most of it is codework. 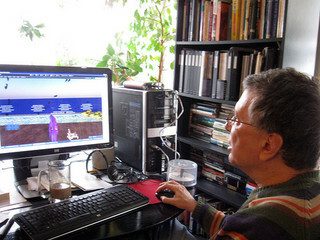 The earlier pieces were produced by interventions into newsgroups, internet relay chat, and email lists; with IRC, this involved using warez programming. Soon I was working with perl scripts, and the julu/ jennifer/ nikuko/ alan materials all came out of that. There are also, at the website, a great number of .exe pieces under html which are interactive directly. Finally, there are mathematical filters that were used and modified in the creation of numbers of texts; these were produced with the help of Florian Cramer and Jim Reith. When I work now, I often do culling, which requires the use of all sorts of linux/unix scripts that I make up on the spot. In the earlier work, also, I was using what was then the Google API for google-scraping, which produced a number of texts. I see almost none of this as poetry, but as works using code, or modifying code one way or another, or being modified by code, etc. Generally I use tools like awk, grep, sed, and perl scripts, sometimes vi or vim, and I’ve used (and rewritten parts of) emacs to create new versions of Eliza. I also worked with a grad student at the New School in the creation of different MOOs and talkers, and I created an lpmud which was used to produced a series of texts. I also used ytalk and modified existing talkers; I was on the quota review board of PMC MOO, and a lot of the texts came out of there. I don’t see any of this as poetry, but as a kind of praxis that interacts with or produces texts that are visible either as remnants of the process, or as documentation of live work – for example all the IRC pieces I did. This has continued into work done in OpenSim and SecondLife, and I use the Internet text to report on this, and to announce video, audio, and image documentation of live interactive performances in these media, often with Sandy Baldwin, that involve dance and choreographjy but above all text generated on the fly within the performance space. I’m not a poet – in fact tomorrow night I’m doing the first poetry reading I’ve done in maybe 12 years, with Clark Coolidge, and have been working to turn this into a performance dealing with the pscyhology of multi-tasking among other things. I know this doesn’t change your take on my work, but even the programs are visible pretty much everywhere. The reading I’m doing with Clark uses among other things perl and awk programs to generate the text… Finally finally, I’ve been doing a series of music/sound improvisations which are also rerported, ranging from a 96 hour improvisation I helped organize at Eyebeam, to ‘alternative saz’ pieces I’ve been working on recently. I know all of these things don’t show up everywhere in the Internet Text (my terrible name by the way), but they do show up sufficiently I think to indicate I’m not placing one poem after another there – far from it. A final example, working with a woman in Australia – we produced a series of broken sexual ytalk texts, in which ytalk itself was ‘bent’ and modified; these led to me writing about the idea of ‘wryting,’ which parallels feminin ecriture, and deals with the embodiment of the body and sexuality within electronic or digitally-produced texts. That’s where the email list I started, wryting-l, originated for me (Sandy Baldwin now co-moderates, and is terrific).